The average police duty belt today can weigh 15 pounds or more. That’s understandable when one considers that firearms, ammunition, handcuffs, radios, flashlights, and more can be found on these indispensible platforms. Increasingly, mobile devices, weapons like pepper spray or TASERs, and cellphones are also regular fixtures. 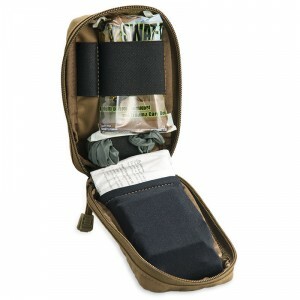 Another common item found somewhere on the officer’s person is the emergency medical kit. This is one item every agency wants to ensure their officers carry, but medical kits need to remain unobtrusive enough that they do not become a burden and are left behind by officers. That is where Chinook Medical Gear comes in. The Colorado-based vendor sells various modules or kits designed for different public safety sectors and does so with convenience, as well as safety, in mind. With the number of duty-belt items going up, it can be good to know that efforts are under way to make the footprint of those options go down. Sales experts with Chinook also can help customers navigate the often-intricate process of finding and seeking financial assistance from government sources. Though these sources are numerous, programs and protocols often change and can be confusing to the uninitiated.